Monitoring temperatures is often necessary when doing tests on circuits and prototypes. 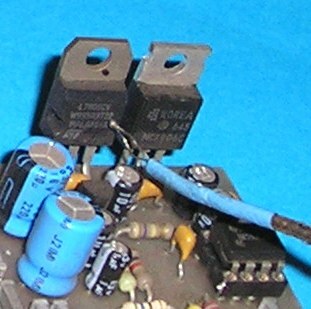 In many cases the failure of semiconductors, transformers and other components occur due to thermal overload. Observing the temperature of critical components during a test can prevent this. Temperature measurements are considered as something basic and a little attention is paid to this. And because it's often unknown how measurement errors occur, unreliable temperature measurements are very common whiteout noticing. Errors of a few tenths degrees Celsius are no exception. 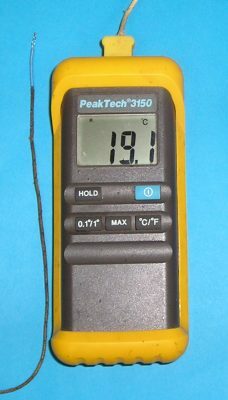 Thermocouples thermometers exist in various designs. There are dedicated instruments like the one on the photo to the right, integrated into a multimeter, as a measuring card for a computer etc. The actual sensor consists of two wires of different metals that are welded at one side; this is the sensor, also known as hot-junction. On the other side the voltage is measured at a temperature compensated measurement block, the cold-junction. There are several types of thermocouples available. The distinction in the various types lies in the two types of metal their are made of. Each sensor has its own temperature range, sensitivity and linearity. The different types are distinguished by their color-code. There are multiple coding standards (BS, ANSI, DIN and IEC) that each have their own color identifiers. The most common used thermocouple is the K-type that has a very linear characteristic. This is usually coded with yellow connectors. The used sensor and processing/reading unit should match. So a type-K thermocouple can only be connected with a device there destined for. Fig. 2: Heat flow of a thermocouple on a surface contact. A universal thermocouple has often a spherical weld to the end. These sensors are only suitable for measurements of liquids and gases. The spherical end can't make a good thermal contact with a hard flat surface. The drawing on the right shows a schematic representation of the situation on the photo in Fig. 4 below. The thermocouple weld has only by a very small thermal surface contact with the measured object. The weld has a relatively large cooling surface to the environment. By a measurement at a surface of 65 °C, the thermometer recorded a temperature of 42 °C. A measurement error of 23 °C! 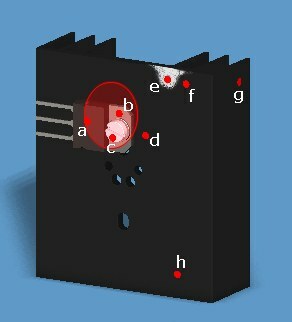 Fig.3: Heat flow of a thermocouple placed in a hole. If the measured object has a deep hole, it's favourable to put the thermocouple inhere. The measured object then surrounds the connecting wires, which improve the thermal contact. It's not perfect but the error will now be greatly reduced. If it is possible fill the hole with a fluid for an even better thermal contact. To do a reliable temperature measurement on objects, a good thermal contact is a must. There are special sensors with ring terminals that are better suitable for surfaces. These can be bolted sturdy to the measured object. Fig. 4: Measurement errors occur due to a poor heat coupling between object and sensor. Fig. 5: Infrared thermometer with LED-pointer. Any object warmer than 0 K (-273 °C) transmitting electromagnetic waves, especially in the infrared spectrum. The intensity depends on the temperature and the surface type of the object. This infrared radiation can be measured with an IR thermometer. The big advantage of these thermometers is that they don't need a physical contact with the measured surface. This makes it possible to measure temperatures on moving objects or on parts who carry a hazardous voltage. Before a measured can be done, the emission coefficient must be set to the correct value that corresponds with the measured surface. Table 2 shows the emission coefficient of some materials. When the absolute radiation constant C [W/(m2*K4] can be set instead of the relative emission coefficient, the emission coefficient must be multiplied by 5.67. Cheap IR thermometers don't have the possibility to set the emission factor. In these cases the emission factor is fixed, typical at 0,95. When doing a measurement on a surface with a different emission factor, the temperature can't be determined correctly. There are special paints on the market with a well-defined emission coefficient. By painting the surface with this paint measurement errors will be greatly reduced. Fig. 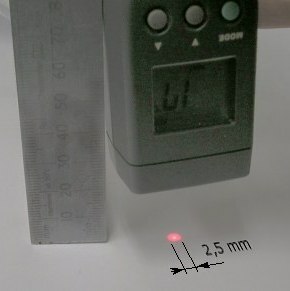 6: An IR-thermometer "sees" no objects behind glass. Glass is fully transparent for visible light, it will transfers virtually unimpeded through. This is not truth for infrared light. The most types of glass will absorb infrared light in the range 8 through 16 micrometers that IR-thermometers sense. Therefor it's not possible to measure the temperature of objects located behind glass. An IR thermometer aimed on glass measures the temperature of the glass itself. Fig. 7: The temperature of polished objects can't be measured. The ambient radiation will be reflected. From shiny objects like polished metal surfaces, the temperature can not be determined. They hardly radiate in the infrared range but reflect this very well. By aiming an IR thermometer on a shiny surface, the temperature of the object will not be measured but instead the temperature of the environment or a mirrored object is measured. An IR-thermometer has an imaginary "beam" wherein it senses the IR-radiation. When this "beam" is aimed on a surface it results in a spot whereof the temperature is measured. Regarding to the "beam" shape there can be divided into short and long distance ranges. IR thermometers are equipped with a pointer for easy targeting and to show the size of the measurement spot. The short-distance meters are equipped with an LED pointer and have a small minimum spot size in order of 3 mm. These are most suitable for electronics use. The small minimum spot size makes it possible to measure the temperature of small components like SMD. The long-distance thermometers are equipped with a laser pointer. They often called misleading "LASER thermometers" whereby the laser plays no role in the temperature measurement itself. These thermometers are unsuitable for electronics purposes because of their large measurement spot. This makes it impossible to aim it at an individual component. So not only the temperature of a single component is measured but also the surrounding area. Fig. 8: A comparative example of the spot size versus distance of IR thermometers with LED and laser pointer. Fig. 9: The IR-thermometer with LED-pointer (detail of the image above). Fig. 10: The small measuring spot of an IR thermometer with LED pointer is also able to measure the temperature of small objects. If the measurement spot isn't focused on the measured component and covers a larger area than just a single component, they will not show the correct temperature. The thermometer measures not only the radiation of the target but also that of the surrounding area. As mentioned before, with IR-thermometers, a wrong emission coefficient setting results in an erroneous temperature measurement. This example shows the impact of a fixed emission coefficient setting to the measured temperature. The target consists of a transistor in TO218 housing mounted on a pre-drilled SK18/75 black anodized heat sink. The heat flux was 15.2 W and the ambient temperature was 24 °C. The emission constant of the thermometer was kept at 0.9 with all measurements. This setting corresponds to measurements on surfaces with a constant radiation of 5.1 W/m2*K4. Fig. 11: Transistor in a TO218 housing mounted on a heat sink SK18/75. The measurement locations are indicated. In the figure on the right the measurement spots are shown in proportion and the measured temperatures are listed in the table below. Measuring point "e" is a small section of blank sanded surface of the heat sink. The other entire surface is black anodized. Black: 75 °C - 24 °C = 51 K.
A huge deviation in measurement results. With the transistor we can see this fault again. The shiny objects (metal mounting plate b and the M4 screw c) measured a much lower temperature than the black plastic housing a. The red circled area is the area that is measured without a clear focus on a specific element. There is a kind of average. But because this field yields different surfaces with different emission coefficients there is nothing sensible measured. In addition to the above thermocouple and IR thermometers are also PT100, semiconductor and other thermometers on the market. These thermometers are like the thermocouple primarily intended for measurements in liquids and gases. In determining the temperature of objects with these devices applies also that a good thermal contact with the measurement objective is essential.